When doing body weight exercises, how do you perform them? Do you utilize the muscles on your glutes, legs and arms (biceps, triceps) or do you engage your core muscles? It is important that you train and develop your core before doing intensive body work exercise like leg pulls and chin ups. If you have weak or undeveloped core muscles, there is no more to support your exercises. And for those neglect their core, they would constantly suffer body aches (all over- limbs, shoulders, etc) and lower back pain. Core muscles are best developed and strengthened using tools that trigger an unstable environment. Helpful tools are like the balance board, stability/physio/exercise ball, medicine ball and the BOSU ball. If you are new to this, always get the help of a trainer or attend a class- that will help you to do it using the right technique. A lot of people make the mistake of trying to overdo core based exercises in the wrong posture- by curling their lower backs as they strained to do these exercises….and end up with pains or injuries. But it is worth learning PROPER techniques because when you have a good core strength, you will do a lot of exercises in the right posture and form and drastically lower your risk to injuries. If you want to learn the exercises on your own, browse around YouTube for good exercises (those that have been viewed zillion of times). I know a lot of guys tend to ignore developing their core but it’s really important. To get a rough idea, check out the list of videos that I’ve compiled from YouTube for Stability Ball and Core Exercises. Once the core muscles are stabilized and strengthened, activating them to help you in strenuous exercises will make your workout very effective. Your body would now work as a whole instead of individually. 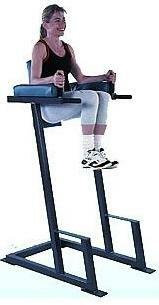 One good example is when you are doing the leg lifts using the machine as you see in the picture (for more information, you can visit beastskills.com/ as you can see a lot of exercises using body weight. Most people will grit their teeth, strain their shoulders and leg muscles to try to pull up their legs. If your shoulders are not strong, it is very easy to injure them doing this workout. A way of doing this exercise effectively is by activating the core muscles- tighten your stomach muscles and use these muscles around your stomach/abdomen to lift your legs. And please remember to breathe normally. Done correctly, this exercise is very effective at developing your upper body strength. By engaging your core, the entire body work as a whole unit, instead of individual parts. And you can do more repetitions at the correct form (means not straining your shoulders or lower back) if you use your core muscles. I find the leg pull and doing push ups on stability balls extremely effective in developing upper body strength- in fact, much more than doing traditional strength training exercises like chest press or shoulder press. I know because I’ve done chest press and shoulder press for a few years. But there has not been obvious improvements to my upper body strength- that become glaringly obvious because I still have problems managing push-ups. However, after developing and engaging my core, not only I can see a more defined upper body (finally, I can look presentable in sleeveless tops) but my activities of daily living has improved. Now, I lift the 19-liter water container to put onto the water dispenser in my office (when the water runs out). Each time before doing that, I will take off my shoes, engage my core muscles and then the lift the container up without spraining my back. And I stop using the chest and shoulder press machines- that I don’t enjoy using but had initially thought were necessary to develop my upper body strength. I only use weight machines to work on my lower body. It’s fun to use natural activities to work on the upper body muscles. Perhaps I may give indoor rock climbing a shot once my strength is good enough. But remember, always develop, build and strengthen the core muscles first before starting intensive body weight exercises to avoid/minimize injuries.